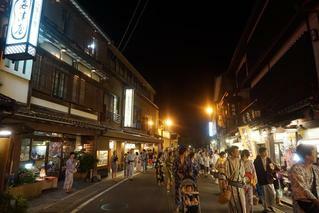 Located in the middle of the bustling hot spring town, conveniently located for shopping and visiting the open-air baths. 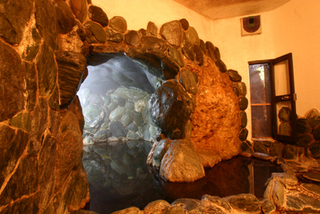 With in our inn is our famous cave bath and open-air bath. Also on display inside the inn is the owner's personal collection of model replica cars, Harley Davidson Motorcycles, warplanes, and more. The popular designs of the guest rooms are thanks to the inn's proprietress. An aquarium sits in front of the entrance, filled with adorable fish from the paddies. The children love watching and interacting with the fish inside. Of course all meals are served in the guests' rooms so that they can enjoy their meals in private and at their own leisure. Beautifully colored yukatas (cotton kimonos) can be specially prepared and brought to the guests' rooms so that they may choose one to their liking, just ask the front desk. We have two famous baths both available for private bathing until 6:30p.m. on the weekdays. Enjoy your stay in the lovely and classical guest room designed by our proprietress. When you are ready to leave let us take you to the station in style with one of our executive style cars. Complete with leather interior and cushy seats for a luxurious ride. 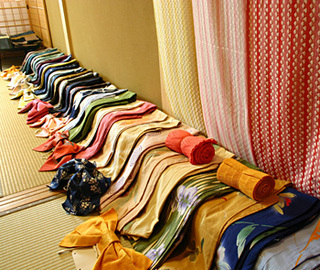 Guests Can Wear Colourful Yukata Robes at the Property. 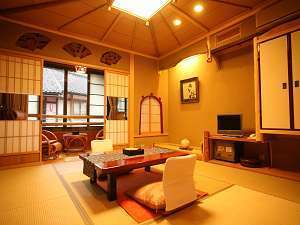 All rooms have AC unit, restroom, washroom, hairdryer, complete yukata(cotton kimono) set, tooth brush, hot water pot, tea set, towels, refrigerator, TV, down-comforter. 3 rooms has a full bathroom and heated table. 9 rooms have washroom and bidet restroom. Open air bath carved from the bedrock of the back mountain's slope. This cave like bath is popular among guests. During weekdays guests may also use the public bath for private bathing. Two baths may be reserved and used for private bathing during the weekdays until 6:30p.m. Guests driving to the inn and needing a place to park may park in the inn's parking lot for free during their stay. They may also stay parked for free for up to four hours after they checkout. There are many souvenir shops located near the station and the inn making it convenient for shopping. 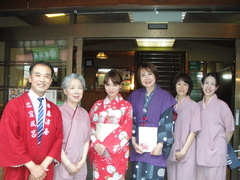 We rent adorably colored yukatas (cotton kimonos) with Japanese patterns to our female guests. They are free to borrow, just ask a clerk at the front desk and they will bring a selection of yukatas to your room for you to choose from. The inn is a three story wooden and pure Japanese structure is built on the mountains incline. One portion of the inn's back annexes are on the mountain's slope making them into the 4th and 5th floors. Our inn's proprietress designed all the guest rooms.